Low water pressure has several different causes. In some cases, you may be able to quickly fix the problem yourself, but the most common cause of low water pressure is pipes clogged due to lime buildup. First, however, it’s important to determine if the low water pressure is only occurring in one faucet or if it’s a broad problem throughout your home. 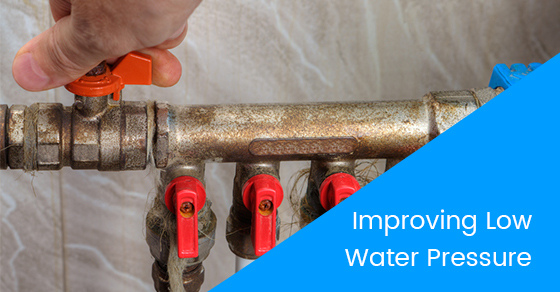 This article will help you to determine the specific cause of low water pressure in your home and how to improve it. If low water pressure is only occurring in one particular faucet, the problem can be fixed easily. In the case of a shower head, for example, it is simply a case of cleaning the shower head of hard mineral deposits. In the case of a bathroom or kitchen faucet, it is typically a matter of cleaning or replacing the aerator. If the toilet is filling slowly, simply replacing the fill valve on the toilet will do the trick. The easiest possible solution to low water pressure is to make sure the shutoff valves located near your water meter are completely open. If this is not the case, you should test the water pressure yourself to determine if clogged pipes are a potential case. Shutoff valves are rarely the cause of low water pressure, but it only takes a few minutes to check to see if they are. Another common cause of low water pressure is a leaky pipe. Look for any dampness around your pipes, particularly at the main supply line. You can also check your water meter to rule out any leaks. If you think you have a leaky pipe, contact professional plumbers immediately. Testing your water pressure isn’t going to fix the problem, but it will be able to tell you if the cause of your low water pressure is due to clogged pipes or if the city may be simply delivering low water pressure (you can see if your neighbours are also experiencing low water pressure). Otherwise, test the water pressure with a pressure gauge and look for pressure between 45 and 55 psi. Keep in mind, however, that if you have recently replaced your pipes or your home is newer (under 20 years old), the problem is not likely because of a clogged pipe but because the city is delivering low water pressure. If the reading is normal, the cause of your low water pressure is likely due to a clogged pipe. In this case, you will want to contact professional plumbers. If the reading is off, it’s possible that the cause of your low water pressure is the city. If you suspect this may be the case, contact the city to see what they can do. If they are unable to help you, one option is to install a water pressure booster system. If you are looking for first-rate professional plumbers to help you improve your low water pressure, contact our team of experts at Brothers Plumbing today. We are one of Toronto’s leading plumbing providers, with over 50 years in the industry and affordable rates.